Epidendrea/Brassavola, Cattleya, Epidendrum, Encyclia, Lealia, & Similar. These include B, BL, BLC, C, L, LC, etc on the tags. This type of orchid likes stronger filtered light. We keep our Cattleya types at 50 degrees or higher. These plants prefer a fairly strong filtered light. Under an Oak tree is a good spot for these. Most like temperatures with a high in the mid 90’s+ and lows as low as 50. The large temperature swings of winter help them to bloom. 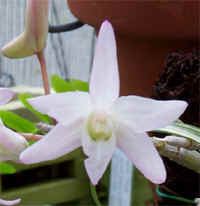 They bloom on new pseudobulbs after forming a sheath which looks like a forming leaf that the buds grow in. Water every few days and fertilize every week. The flowers are typically fragrant and many are very large. Re-pot once a year if needed when new growth is getting roots. Cut in sections of 3 or more pseudobulbs and use a pot clip or wire to hold the divisions firm in the pot until they have rooted thoroughly in the new pot. These are truly interesting orchids. They do not have solid bulbs like other orchids. 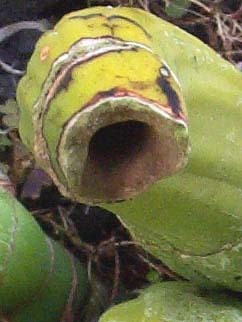 Instead they have a tube (hollow center) in the bulb which is used by ants to travel the plant.